Since 2004, Larlin's Home Improvement has provided carpentry services to the community to build, assemble, remodel and construct simple and complex residential and commercial projects. Ready to tackle any small or large job, Larlin's Home Improvement can work with or without owner-provided blueprints, to construct any type of project you have in mind. They can help you create or make changes to your home, by constructing a new doorway, new window, stairs, attic stairway, deck, gazebo or barn. Larlin's Home Improvement can also build or repair wooden furniture, including cabinets, bookcases, shelves, decks, gazebos, picnic tables, deck chairs and more. Home repair, including damaged flooring, door jams, etc. Affordable – Larlin's Home Improvement always prices their jobs affordably against their competition, and guarantee top quality professional work. Call Larlin's Home Improvement at (203) 267-0607, for your reasonably priced quote. Guaranteed Satisfaction – The qualified, experienced professional carpenters at Larlin's Home Improvement stand behind the work they perform. 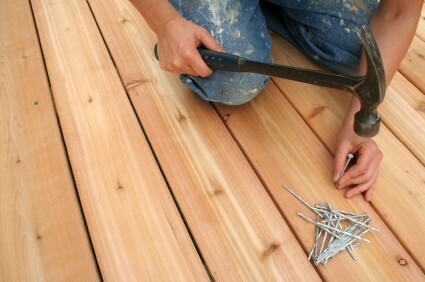 Larlin's Home Improvement offers a full satisfaction guarantee to ensure the job is performed according to your needs. Larlin's Home Improvement has the carpentry skills, experience and knowledge to construct your project according to local building codes. Call (203) 267-0607 to learn more how Larlin's Home Improvement can build your vision today.